What is Natural Face Lifting? 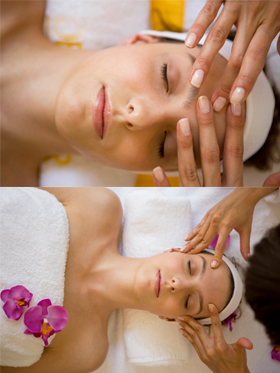 The Natural Face Lift Massage is facial rejuvenation. It is a gentle non-invasive treatment which will help to return your face to a more youthful appearance. You will lay face upwards fully clothed on a couch during the treatment. There are no creams or oils used during, before or after this treatment only gentle massage techniques and energy balancing which will release deep tensions and lift facial muscles. Throughout our lives our thoughts and emotions eventually start to show on our face, by locking expressions into our facial muscles. Each muscle contracts and the collagen and connective tissue of the skin locks encouraging ageing, wrinkles and sagging! With gentle massage and energy balancing tension are released freeing layers of muscle and connective tissue allowing for better circulation and elimination. The repetitive hand movements help to iron wrinkles away. The facial muscles are toned giving a more lifted appearance and reducing sagginess. The body’s lymphatic system is encouraged, boosting the immune system and the removal of toxins. The freeing of restrictions in the connective tissue allows the fibers to slide past each other freely, giving suppleness and flexibility to the face. The freer flow of blood permits better oxygen and nutrient flow helping to increase alertness improve skin complexion and increase feelings of general well being.